Three new custom decks of the Omnia Series by Thirdway Industries, designed by Giovanni Meroni and proudly printed by Expert Playing Cards Co. with Classic Finish. Based on the ancestors of the first Omnia, these decks will throw you in the Golden Age of the Omnia universe, full of treasures, heroes and war. "The Origin" extra joker unlocked. Free if you pledged for at least three decks. You will get 2 of them if you have a brick. Secret Mid-Campaign stretch goal! Carat X3 Unlocked! Add +19€ USA and +28€ world to your pledge to have it. You can add as many as you want. See below for details. Uncut sheets and Uncut Tuck boxes are available as add-ons. Check the "Add-ons" part below! Extra cards unlocked for all decks! Pecunia Astra is unlocked as add-on. Add +13€ to your pledge if you want it! You can add as many as you want. The coin will be 2",made by copper, with Unmasked Luna on one side and Sole's Mask on the other. See below for informations on add-ons. Everything is different from the previous Omnia Campaign. The style is the same, but everything has been redesigned from scratch. New characters, new symbology and a new limited edition. Omnia Perduta is unlocked, and all the rewards will be automatically split. For example, if you have 6 decks, you'll receive 3 Antica and 3 Perduta. If you have an odd number of decks, the unpaired one will be random. Suits are inspired by ancient civilizations, for example Hearts are inspired by Egyptians. The King is a Pharaoh, and the Jack is a priest of Life. Spades are inspired by Babylonians and Persians. Clubs are inspired by Greeks.The Jack is a Hoplite warrior, and the King is a Philosopher. Antica King of Spades and a pip card. Pips are elaborate, custom and include metallic inks. Check below to know more about Antica Symbology. The legendary, remote past of the Omnia Universe, full of God and Heroes. When everything started. Omnia Magnifica is available only in special rewards who include 2 or more Omnia: The Golden Age "unlimited" decks (Antica, or, if Perduta is unlocked, split between Antica + Perduta). Omnia Magnifica hearts, Egyptian. The King is inspired by a divine Pharaoh. Spades, Persian/Babylonian. The King is inspired by a Sultan. Diamonds, Romans. The Jack is inspired by an epic Gladiator, and the King is an Legatus. Clubs, Greek. The King is a blind Prophet, that can see future. The Jack is his personal guard. Queen of Spades is a warrior of the desert, and needs a cloak to protect herself. The Queen of Clubs is a Phytia, an epic warrior priestess who protect the Island of the Sun. Jokers are very important for this deck. They are Sole, the God of the Sun, and Luna, the Goddess of the Moon. Luna's mask is on the tuck box front and Sole's masks are on the back. Ace of Clubs and Hearts pips, with metallic ink. The powerful queens of two distant empires in war. I consider Omnia Magnifica as my most baroque deck so far. A forgotten era of war and destruction. Perduta Ace of Spades, with two scimitars and a bow. Perduta courts are warriors, with a lot of sharp blades and heavy armors. I thought about a Spartan Warrior when I designed the Perduta Jack of Clubs. The Gladiator and the Ace of Axes. The Ace of Khopesh and egyptian warrior. The Pharaoh and the Queen of Hearts. Perduta was the stretch goal deck of Omnia: The Golden Age, and now it's unlocked because we reached € 20,000. €15,000 - Omnia Antica & Magnifica will be funded! \\ REACHED! €20,000 - Omnia Perduta unlocked \\ REACHED! €25,000 - Embossing on all decks \\ REACHED! €28,000 - Pecunia Astra unlocked as add-on! \\ REACHED! €35,000 - Inner foil on all decks \\ REACHED! \\ MID-CAMPAIGN SECRET \\ CARAT X3 UNLOCKED! €38,000 - Extra card on all decks \\ REACHED! €42,000 - "The Origin" extra joker unlocked! The Origin extra joker is NOT available as add-on. This card will be printed almost only for be a gift to Kickstarter backers. For have it, you have to pledge at least for 3 decks (of any kind, not necessarily the limited edition. Even the €33 pledge level with three decks will do). I will put another extra Joker in every brick, so if you have a brick you'll get 2 The Origin extra cards. You can add to your pledge both Antica than Perduta decks. Magnifica is not available as add-on. Add-on a brick is very worthwile, just +100€ for domestic and +125€ for world. I have partnered with Carat Card Cases™, one of the best manufacturers of acrylic card display cases, and I am proud to announce the world premiere of the Carat X3 case. This case fits three decks perfectly. I believe this item is a wonderful add-on for any collector who wants to display their decks in an elegant, sturdy and transparent case which also protects them as well...it fits perfectly with the Omnia:The Golden Age campaign. The cases are made from 5mm acrylic sheets which are extremely transparent and sturdy. The lid is secured to the case with neodymium magnets, 10x stronger than normal magnets. I was really impressed when I saw this box, the quality is outstanding. Add +19€ USA and +28€ world to your pledge to have it. Please also send me a PM with the number of Carat X3 Cases you want, so I can maintain a running total. You can add as many Carat X3s as you want. When it's possible, the fulfilment center will put your decks into the case for extra protection and optimizaton. I am allowing pledges for multiple Carat X3 cases because I believe many of you will want use it for other decks in your collection - for example, the first three Omnia Decks. Carat X3s are not branded, so you can use them with any decks you wish. We are evaluating some minor details on the Carat X3, so the final product may change a little. ...and Sun Mask on the other. I'll start making just 100 coins, and I'll order more if the request will be high. I won't print it again and, as always, the unsold coins will be sold on www.thirdway.it at a higher price. Wooden support not included. Uncut sheets are now available! Send me a PM when you add an uncut sheet, telling me wich one you want. Uncut Tuckboxes are now available! Add +25€ (+30€ intl.) for all the three uncut tuck boxes. Please send me a PM when you add the uncut tuck boxes to your pledge. 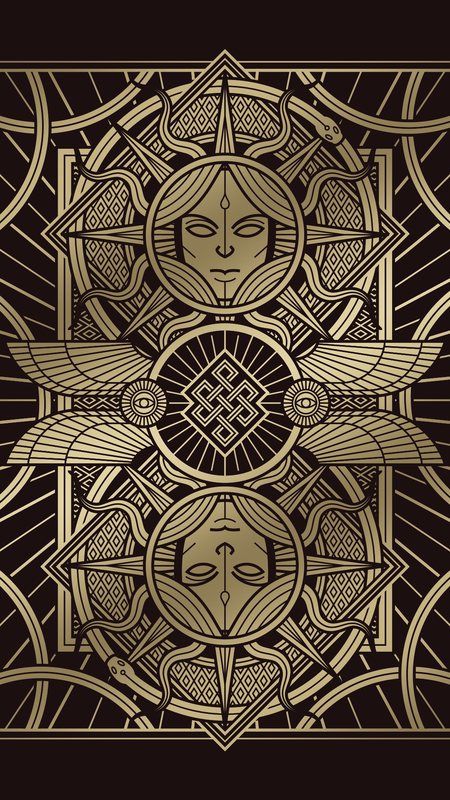 If you are a proud backer of Omnia: The Golden Age, you can support the project changing your profile image (Kickstarter or Socials) with our badges. A lot of Magnifica and Antica courts available. Take photos of this paper is very difficult, it change a lot with different lights. The paper is uncoated and totally awesome in person, much better than the pics. 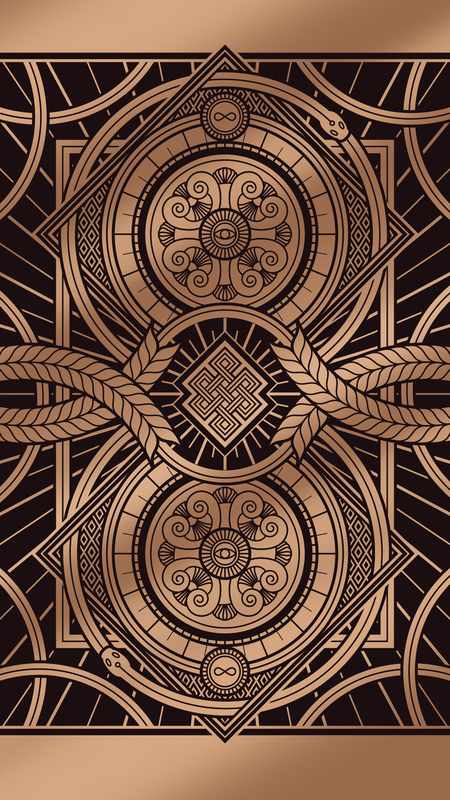 There are three different Omnia: The Golden Age decks, and every deck represents a dimensional plane in the ancient era of the Omnia Universe. Magnifica is the most remote, legendary Era, Antica is the prosperity Era and Perduta is the war Era. All of them are remembered as the "Golden Age". This card represents the couple who created the Omnia Universe: a young Sole unmasking her bride, Luna. I decided to call this card "The Origin". In my vision, this is the first card, in chronologic terms, of the Omnia Series. 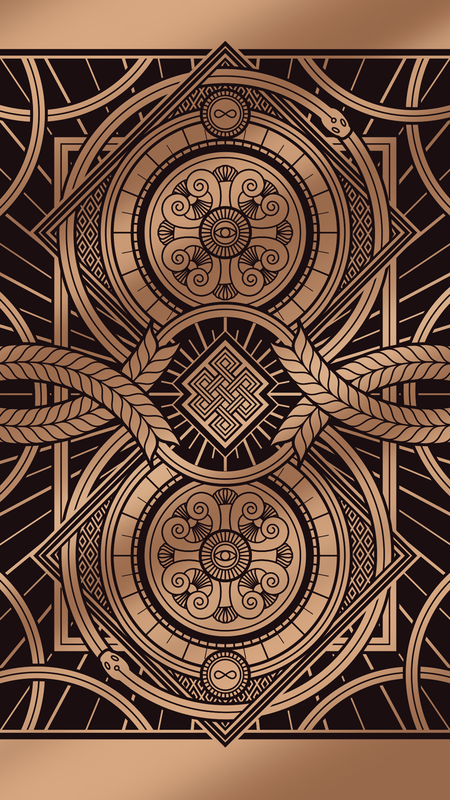 The Endless Knot or eternal knot is an ancient symbol of Tibetan Buddhism. It has a lot of meanings, including the endless continuum, the rebirth and the infinity. 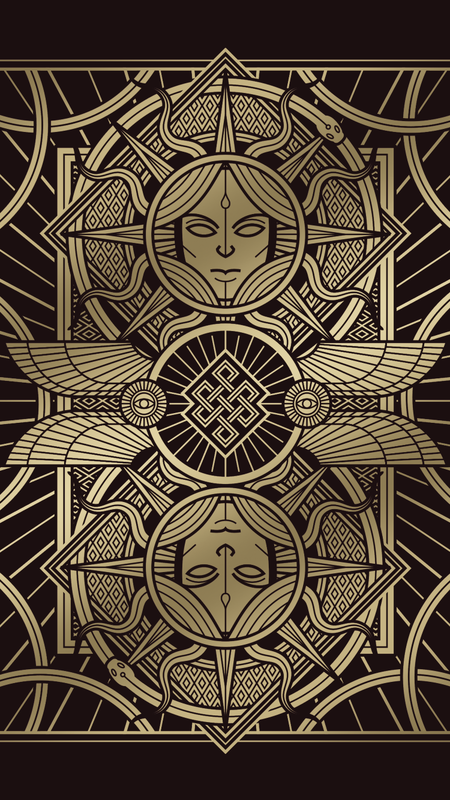 It is the main symbol of Omnia: The Golden Age. Sole and Luna are the Sun and the Moon, the main divinities of the Omnia Universe. Like the Chinese Yin and Yang, they represent the two opposite faces of the world and the cycle of the night and day. The enigmatic Sphynx is a mythical creature from Egyptian and Greek culture. She is said to have guarded the entrance to the City, and to have asked a riddle of travellers to allow them passage. The Wanderer is said to be a God in disguise in the mortal's plane. Diamonds are inspired by Romans. The Jack is a Phalanx Warror, and the King is inspired by the most famous dictator of the Roman Republic, Julius Caesar. Omnia is a Thirdway Industries deck, and will be available on Thirdway Store when the campaign will be over. It's a standard procedure and should go smoothly. This is my third Kickstarter and I already worked with EPCC for Evil Deck, Delirium and my first Omnia Project. All the Omnia layouts are approved and ready to be printed when the campaigns ends. I am located in Italy, and I can't do the fulfillment directly: I'm using a professional fulfillment center. They have already shipped a lot of Kickstarter decks and have a lot of experience in this field. Two (2) Omnia Antica Decks. If Omnia Perduta will be unlocked, you'll get 1 Omnia Antica and 1 Omnia Perduta. Three (3) Omnia Antica Decks. If Omnia Perduta will be unlocked, you'll get 1 Omnia Antica and 1 Omnia Perduta and a random Antica/Perduta deck. One (1) Omnia Magnifica + Two (2) Omnia Antica. If Omnia Perduta will be unlocked, you'll get 1 Omnia Magnifica, 1 Omnia Antica and 1 Omnia Perduta. 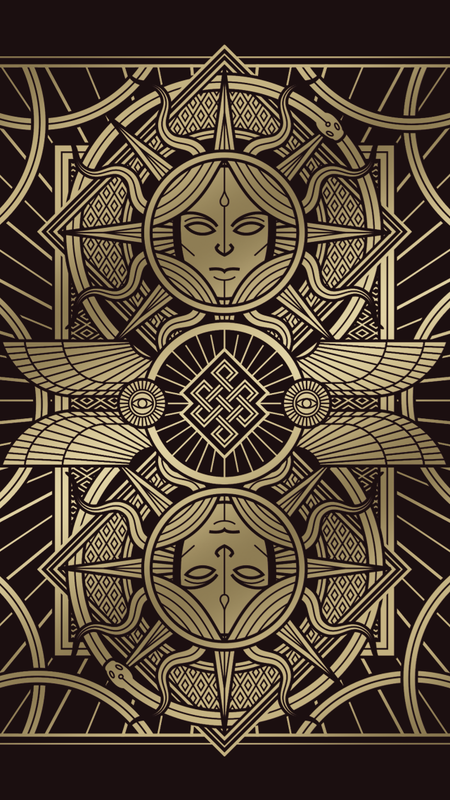 Three (4) Omnia Antica Decks. Half Brick - Six (6) Omnia Antica Decks. If Omnia Perduta will be unlocked, you'll get 3 Omnia Antica and 3 Omnia Perduta. Two (2) Omnia Magnifica + Four (4) Omnia Antica. If Omnia Perduta will be unlocked, you'll get 2 Omnia Magnifica, 2 Omnia Antica and 2 Omnia Perduta. Brick - Twelve (12) Omnia Antica Decks. If Omnia Perduta will be unlocked, you'll get 6 Omnia Antica and 6 Omnia Perduta.